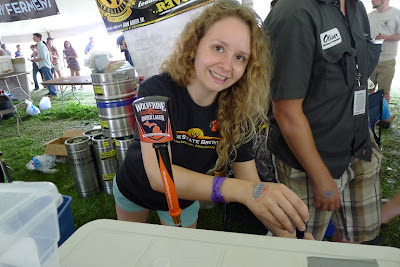 Tanya of Wolverine Brewing at last weekend's Summer Beer Festival. The beginning of August is rather anti-climactic, coming as it does after the catharsis of the Summer Beer Festival. But it's probably just as well. Admit it: you're still nursing a low-level hangover, aren't you? You need a little time to continue your recovery, and a low-key Week in Beer is just what the doctor ordered. Read on for your prescription. » The next Michigan Brewers Guild beer festival is September 7 in da U.P., eh? But that’s a long drive. Fortunately, Detroit is pretty close, so if you can wait until October 25-26 to get your fest on, you’ll be interested in getting tickets for the Detroit Fall Beer Festival, which go on sale today at 10 a.m. Go to mibeer.com to get yours. » It's National IPA Day, and the Corner Brewery, 720 Norris, Ypsilanti, is offering a special hops-infused experience. All day long, use the brewery's French presses to dry-hop your beer with different varieties of hops, including Sorachi Ace, Fuggle, Chinook, and Simcoe. » Ashley's, 338 S. State, is also celebrating IPA Day with a bunch of them tapping at 6 p.m., including the exclusive More Black IPA from Kuhnhenn Brewing. It’s the latest Ashley’s 30th anniversary ale, described by the brewery as having “assertive fruitiness with a grapefruit hop aroma and medium bitterness… the finish is clean with a touch of caramel.” Also pouring from Kuhnhenn: DRIPA (Double Rice IPA), Fluffer Session IPA, and Raspberry Eisbock (yeah, not an IPA, but an incredible brew your correspondent recommends highly). Other IPAs: Blue Point No Apologies Imperial IPA, Clown Shoes Hoppy Feet Black IPA, Dark Horse Artic Dekoorc Eert IPA and Double Cooked Tree Double IPA, and Dogfish Head 90 Minute IPA. » Free beer awaits you at The Wine Seller, 2721 Plymouth, from 5-8 p.m. as Arbor Brewing’s Kayla Brereton walks you through samples of several brews. Rumor has it one of them may even be a sour ale. » Beer Enthusiast Monday at Red Rock Downtown Barbecue, 207 W. Michigan, Ypsilanti, commences beginning at 6 p.m. This time, the focus is not on a single brewery, but on the “Best of Michigan.” Look for beers on tap from Arbor, Arcadia, Bell’s, Dark Horse, Founders, and New Holland. And smoked chicken wings. Mmm, smoked chicken wings. » It’s Brewer’s Night again from 6-9 p.m. at the Grizzly Peak Den, 122 W. Washington. Or is it? For the first time ever, the festivities go underground, to the new Old German basement bar, where head brewer Duncan Williams and his fellow beer Morlocks will be, waiting to give you a tour of their subterranean lair. Also on hand: specials on samplers and a cask of Put Up Yer Dux Belgian Golden Ale (dry-hopped with Saaz). » Head to the Arbor brewpub, 114 E. Washington, where Micro Madness is set to be unleashed from 7-9 p.m. Sample more than two dozen beers from around the country chosen not for their style but solely for their awesomeness. Enjoy an appetizer buffet alongside all the brews, and stick around for all the door prize drawings. Tickets are $25 in advance and $30 if purchased on tasting day. Call 734-213-1393 or buy at the pub. Biercamp, 1643 S. State, is now selling fragrant hop wreaths, priced from $15 to $45. Also their Vienna IPA and Wheat Ale are both back on tap.